I will guide you with ‘step-by-step instructions to achieve successful ‘drawing’ and painting study of Leonardo’s beautiful Portrait. If the drawing is too daunting there is an option to have the canvas pre drawn up for you so you can concentrate on the painting of the image.! (an extra $50 applies). 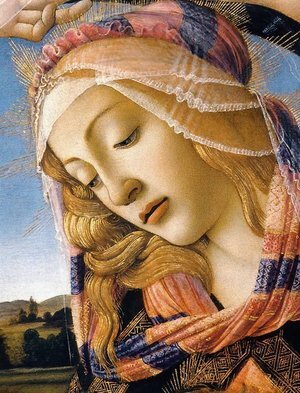 Participants will complete the course with a fully realised 'copy'/'study' of Leonardo da Vinci's Madonna Litta c1490 or Sandro Botticelli’s Madonna of the Magnificat, 1483 ca. During this course you will gain invaluable drawing and oil painting techniques as well as invaluable skills such as glazing, colour mixing, tonal values and the importance of preparing your painting with a monochromatic underpainting. Linen canvas on board and drawing materials. Fully researched, comprehensive instruction (and notes) on how to set up your drawing, how to use oil glazing techniques over Grisaille (monochrome) under-paintings.